A genetics specialist at the University of Northern BC, Mark spends his free time studying long-toed salamanders and other amphibians. Recently, he started a not-for profit society called the Northern Amphibian Monitoring Outpost Society of BC to monitor, research and raise awareness about amphibians in northern British Columbia. Like many species in this region, amphibian ecology hasn’t been studied extensively and their habitat and lifecycle are not yet documented. With initial funding from the Aleza Lake Research Forest Society seed grant program and recent funding from Mountain Equipment Coop, BC Hydro, and the BC Ministry of Environment, Mark and UNBC Ecosystem Science and Management Program senior lab instructor, Saphida Migabo, are working on a 5 year study on amphibians, with specific attention to long toed salamanders (latin: Amboystoma macrodactylum). One of the particularly interesting aspects of this study is exploring the possibility of using their dorsal skin colour and pattern to essentially ‘fingerprint’ them. This can help to recapture and monitor the same individuals over time. Mark and Saphida’s field crews photographed salamanders throughout the summer of 2008 and last year they also documented habitat features and ecosystems where the salamanders are found. 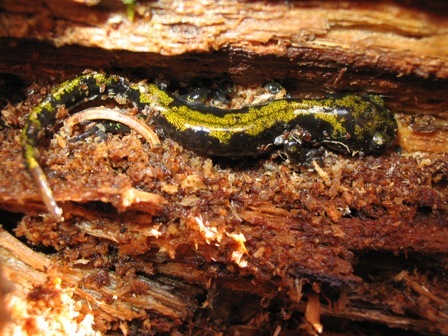 As these datasets grow we can learn more about how to better manage our forests for salamanders in the future, and we can teach future resource managers about them too! Previous PostBerenstain Bears at ALRF?Next PostBeauty is in the eye of the beholder.